Calvin Refusing The Lord’s Supper To The Libertines, In St. peter’s cathedral, Geneva. Inevitably, tension can arise between the church and the civil order, especially when kings and magistrates abuse their power and the state poses obstacles to genuine holiness. How should the church respond? Should the church meekly comply, or engage in passive resistance or even actively rebel to overthrow an oppressive government? In response to such tension, Calvin’s political realism is evident. Calvin exhorts his readers not to submit grudgingly but to think most honourably of the magistrate’s office and to take care not to attack the office pointlessly. He even counsels soul searching for those contemplating rebellion in case their suffering was a case of God using a bad ruler to punish them for their sins. Calvin bolsters his case with additional examples from the Book of Daniel and 1 Samuel (Inst. 4.20.26-27). However, it should also be noted that Calvin also provides clear exceptions to the rule for obedience to rulers. In general, even if rulers should turn out to be oppressive and unjust, Calvin recommends “passive resistance” while awaiting God’s vindication. Calvin assures the faithful that their patient endurance will not be in vain as God wrath will eventually be directed against unjust rulers – “Before His face all kings shall fall and be crushed, and all the judges of the earth, that have not kissed his anointed [Ps. 2:10-11], and all those who have written unjust laws to oppress the poor in judgment and to do violence to the cause of the lowly, to prey upon widows and rob the fatherless” (Inst. 4.20.29). It may be admitted that Calvin’s counsel of passive resistance can be seen as a call to unconditional and unnecessary subservience by modern citizens who have witnessed the overthrow of tyrannical regimes in modern revolutions. However, critics should bear in mind that “private citizens” in Calvin’s time had no experience in social activism, and movements of protest and rebellion had tended to end up in chaos and destruction. 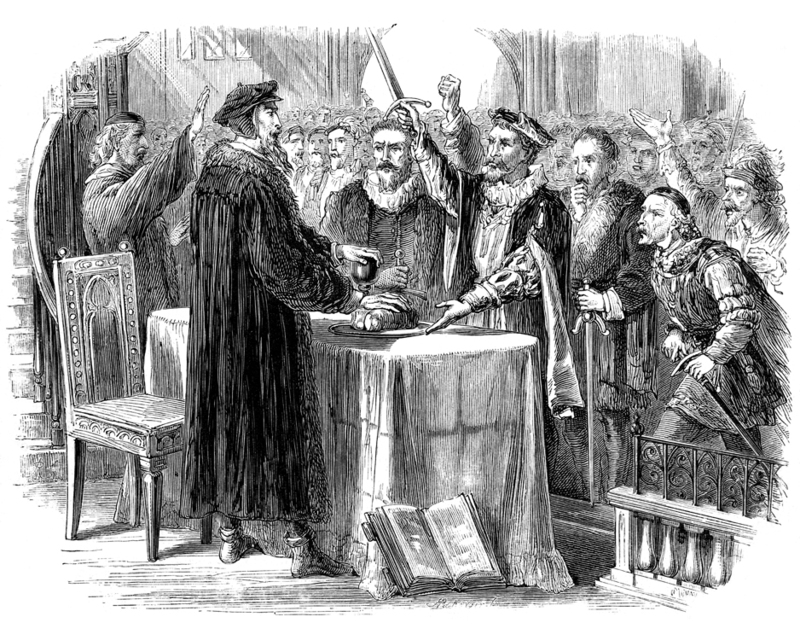 The negative consequences of the ill-fated rebellions led by German peasants whom Luther riled against must have been fresh in Calvin’s mind when he gave his general counsel for passive resistance and called for trust in the justice of divine providence. So let us faithfully pay to princes the tributes which are due to them, let us be ready to give them all civil obedience; but if, being not content with their degree, they go about to pluck out of our hands the fear and worship of God, there is no cause why any should say that we despise them, because we make more account of the power and majesty of God. (Commentary Acts 17:7; cf. Commentary Jeremiah 1:9). In short, Calvin opens the door to justifiable resistance against an oppressive order in the name of utmost loyalty to God. However, resistance should not be equated with rebellion to overthrow rulers. Calvin expresses reservation over the possibility of common people or private citizens actively rebelling against unjust civil authorities since mobs by nature are uncontrollable and destructive. Instead, he openly and strongly urges magistrates to actively oppose ungodly rulers. One wonders if Calvin was being unnecessarily cautious when he restricted the duty of active resistance to the magistrates. Perhaps this was due to his political realism given the historical circumstances, but it obscures the political consequences of his concept of God’s new order as one that involves the contribution of every individual, and his eschatological ideal of the kingdom of God with its abolishment of distinctions of order and degrees of honour: “Hence as the world will have an end, so also will government, and magistracy, and laws, and distinctions of ranks, and different orders of dignities, and everything of that nature. There will be no more any distinction between servant and master, between king and peasant, between magistrate and private citizen.” (Commentary 1Corinthians 15:24). 1. “Prefatory Preface to King Francis” in John McNeill, Institutes of Religion, Library Christian Classics (Westminster, 1960 & 2006), p. 12. 2. John Calvin, Institutes of the Christian Religion. 1536 Edition. Tr. Ford Lewis Battles (Eerdmans, 1986), p. 210. 3. Quoted in John McNeill, Institutes 4.20.32, p. 1519, n. 54. See also John McNeill, “Calvin and Civil Government” in Donald McKim ed. Readings in Calvin’s Theology (Baker, 1984), pp. 260-274. 5. Walzer, The Revolution of the Saints, pp.1-2. W. F. Graham notes that to the Calvinist the real world to be taken seriously is not that of courtly princes but that of farmers, scholars, knights and clergymen: The Constructive Revolutionary: John Calvin and His Socio-Economic Impact (John Knox, 1971), p. 79. 6. Walzer, The Revolutionary of the Saints, p. 64. 7. Harro Hophl, The Christian Polity of John Calvin (Cambridge UP, 1982). For a historical account of the process. See Quentin Skinner, The Foundations of Modern Political Thought vol. 2 (Cambridge UP, 1978). 8. Hophl, ibid., p. 217. 9. Lord Acton, Lectures in Modern History (Fontana, 1960), pp. 134, 136. See also Francois Wendel, Calvin (Fontana, 1963), p.79. 10. Thomas G. Sanders, Protestant Conception of Church and State (New York, 1964), pp. 254-255.